Tutmarc Architects was founded in 1982 by Michael Tutmarc. Michael studied architecture at the University of Washington and began designing his own residential projects straight out of college. More than thirty years later, Michael’s growing list of projects includes a vast variety of residential remodel, residential new construction, and light commercial designs. 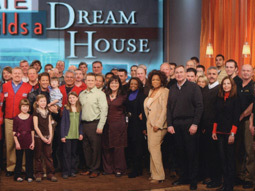 Highlights of Michael’s career include doing design work for Seattle Seahawk quarterbacks Jim Zorn and Dave Krieg in the early years and serving as principal architect alongside interior designer Nate Berkus and landscape designer Jamie Drurie in 2008 on The Oprah Winfrey Show’s largest remodel project ever. When not working, Michael enjoys travel, tennis, golf, photography, and watching movies. He has served on the Union Gospel Mission Executive Board since 2006. 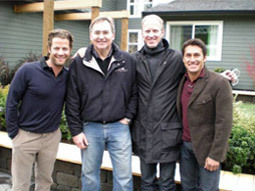 Greg Andrews has been an architect with Tutmarc Architects since 1992. He did his undergraduate work at the University of Michigan and then obtained a Masters of Architecture from the University of Washington. Since then, he has been involved in a large variety of projects and brings great experience and imagination to the design process. Besides architecture, Greg’s interests include travel and great cuisine. Andrea specializes in project management, product selection, interiors, and computer aided design. She also handles all legal and business compliance matters. Andrea has an undergraduate degree from the University of Washington, a law degree from the University of San Diego, and language certificates from the University of Nantes and the University of Caen in France. She is a licensed attorney in Washington and California and a published author of articles on a range of topics including business law, fashion, and literature. She loves books, movies, travel, food, and great design. We strive to offer great creative design solutions and responsible methodology. We can handle the entire project starting even before land acquisition all the way to final completion. We put the client first, who can count on Tutmarc being more than willing to take responsibility for the success of the entire project. "As a homebuilder of some volume myself, I have never seen anyone able to apply both the right brain of a builder and the left brain of an architect like Mike Tutmarc - the outcome has been extraordinary for both my wife and me." "Mike has a creative talent for design. He combines the best use of the site, the exterior and interior with the desires of his clients. This, added to unique touches and finishes, sets his plans apart from the norm. He uses a very talented work crew; they were all friendly and easy to work with. We have been in our island beach house for 12 years and are still in love with it. We continue to get very nice unsolicited comments on it, from both friends and people passing by." "We hired Mike to do a major remodel and a second story addition on our Laurelhurst home some years ago and have had him do multiple other projects for us ever since. It has been great to have someone in the architect/ build business that we can trust so we know that whatever we need will be done both creatively and efficiently. It has been a great relationship for my wife and I over the years." "We have worked with Mike about 15 years on a range of projects. One of the great things about working with him is the versatility of his team. We can count on him for the same attention to detail and great result whether it is an industrial strength concrete retaining wall, a new kitchen, or extensive updating of all interior flooring, fixtures and trim. And, we love the continuity and quality of his people. We have seen the same capable and pleasant folks over the years. That says something to us about how he runs his business and give us added confidence." "We hired Mike to design an extensive addition and complete remodel of our View Ridge home. A few years later he designed and built a new office complex for our law practice. We have been extremely happy with both projects and appreciate Mike's creativity, his practical approach, and the great attention to detail. As a result, we actually enjoyed the process both times."